It’s always with some trepidation that we approach a modern adaptation of a well-known classic. Reinventing a script from the 1890s and turning it into something that’s relevant and relatable to contemporary audiences is no easy task. It often just feels gimmicky and forced. So it’s with much relief that we see Melissa Bubnic’s reimagined Hedda Gabler doesn’t just do the original Ibsen work justice, it’s also exceptionally relevant to modern Australian society. The script surges between devilishly funny, high-paced dialogue, and tense, sparse, dramatic scenes in which you can hear your own heightened heartbeat. Our modern Hedda (Danielle Cormack) is in a marriage of convenience with a Gold Coast ice baron, George (Jason Klarwein). She’s moved from Melbourne to live in a garish Mcmansion with her new husband and quickly alienates George’s cashed-up-bogan family and friends with her sneering superiority. Hedda manipulates every situation to her best advantage in a drug-fuelled, violent and ultimately deadly game of dominance over the men who seek to control her. There are some clever character tweaks in the script. Councillor Brack (nee Judge Brack, played by Joss McWilliam) is a corrupt politician in bed with the ice cartel, and he regularly objectifies and harasses women. Ejlert (Jimi Bani) and Thea (Bridie Carter) are recovering addicts living in Byron. Ejlert was once in line for the position in the drug cartel now held by George. He’s clean and out of prison, and his return to society threatens George’s livelihood. It’s a smart way to swap out Ibsen’s intellectual academics competing over who can write the best paper into something very relevant for a society in the grips of an ice epidemic. Aunt Julie (Andrea Moor) is one of those instantly recognisable Gold Coast characters; a bottle-blonde, big-breasted, tanned women of a certain age who drips in gold jewellery and probably keeps the white trouser and leopard print clothing makers of the world in a job. There’s also the typical Byron Bay hippy in the mix in the form of Thea, whose voice acts as the moral compass of the play. Possibly the least changed character is housekeeper Berta, yet Helen O’Leary puts such an honest, down to earth, hardworking Aussie shiela spin on the part that really brings the role into the present and differentiates it from the original. The story explores the ways in which classism and snobbery have crept into Australians’ attitudes to each other. It looks at the bright, superficiality and hedonism of the Gold Coast versus the entrenched superiority that black attired, latte sipping southerners tend to have when meeting Queenslanders. It challenges the assumption that all northerners are racist, tasteless, small-minded morons. Gender politics plays a huge part in the narrative and moral of the story. Power, inheritance and control are all put under the spotlight, as is infidelity, harassment and abuse of authority to force sexual consent. Those viewers who are upset by domestic violence may find the scene in which we see the results of a severe bashing of one of the women a little too challenging. There are also gunshots, a dead bird and lot of blood and vomit on stage, so if you’re the squeamish type you may need to look away from time to time. When it comes to the technical, there’s not a lot to fault. The costuming is perfection. You know exactly who every person is from their attire, before they even speak. We do have a couple of somewhat unconvincing wigs in there, but you can easily see past that. The lighting has that eye-searing brightness of a Gold Coast summer. Emma Valente’s lighting design also faithfully reflects a warm, yellow dawn and the blue, cool darkness of night at poolside. The crisp, white, minimalist set design by David Fleischer is an inspired choice. At the top of the show it’s pristine and perfect, the only item out of place a yellow tennis ball atop the roof of the house. Everything else is white, glass and silver. At the end of the show, the stage shows the visual scars of the horror and debauchery that’s occurred. It’s a pronounced graphic contrast that really sticks with you. Director Paige Rattray should be commended for the wonderful work she’s drawn out of the cast and crew. Especially notable is the touching performance by Bridie Carter as Thea when she confronts Hedda about her morals and choices in supporting violent men in the ice trade. 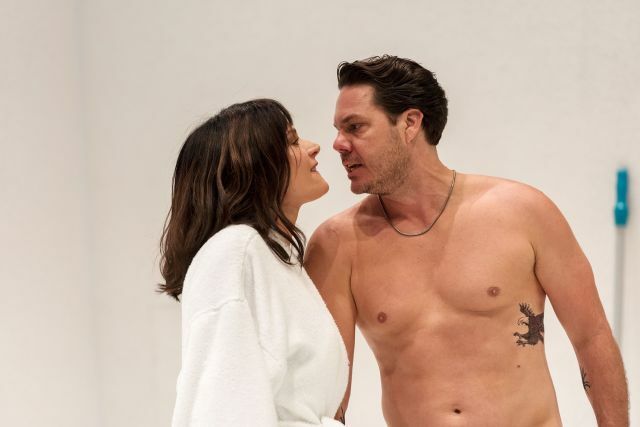 It’s fabulous to see Jason Klarwein back at QT and while he and Danielle Cormack both seem to have a little of that self-consciousness that opening night nerves bring, both are stellar once they get their first few lines out. Andrea Moor shows excellent comic timing, delivering some of the funniest lines in the show. Jimi Bani when he believes he’s lost the woman he loves is heartbreakingly real, displaying brave risk-taking. Heddais an entertaining and at times confronting look at crime, power and obscene wealth. It explores important gender issues and leaves you with plenty of food for thought. Where Ibsen’s work might feel plodding and dusty, this reimagining has all the pace and tension of an addictive action thriller. It’s an exciting final production for what’s been a very successful 2018 season for Queensland Theatre.